The Pneupard is a creation of researchers Andre Rosendo and Shogo Nakatsu, under the supervision of Kenichi Narioka and Professor Koh Hosoda at Osaka University's Graduate School of Information Science and Technology. Pneumatic artificial muscles may be made from a rubber tube sheathed in nylon, but they contract much like the real thing when filled with air. They can pack a lot of power in short bursts and are also highly flexible and impact-resistant, giving them a lifelike quality that is often missing in robots powered by electric motors. The muscle contractions, when combined with limbs that accurately replicate the length, forces, and range of motion of a real cat, naturally generate a lifelike movement. Take a look at how Pneupard steps over obstacles. Each hindlimb possess 7 air muscles for flexion/extension, helping researchers understand their function during locomotion. Leg lengths and muscle moment arms are based on Cheetah's dissections and muscular pattern is based on EMG data. 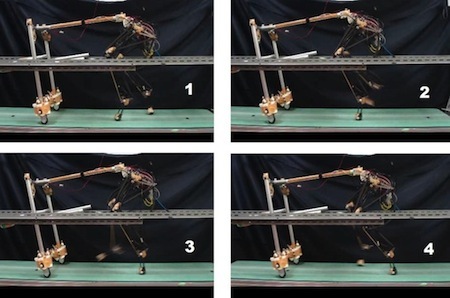 The robot is attached to the sliding strut performing adaptive walking on the treadmill. The only sensor used is a force sensor on each foot. 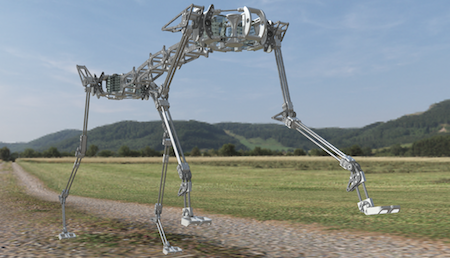 Due to construction differences with air muscles the legs are asymmetric. Are you a fan of the slamhound from William Gibson's 1986 novel Count Zero?